Bilbo the blue tongue skink graciously displaying his bright blue tongue. Cub scouts lined up for a photo finish with our 16ft Burmese Python "Missy"
A set up and display at the Mokena Business Expo. 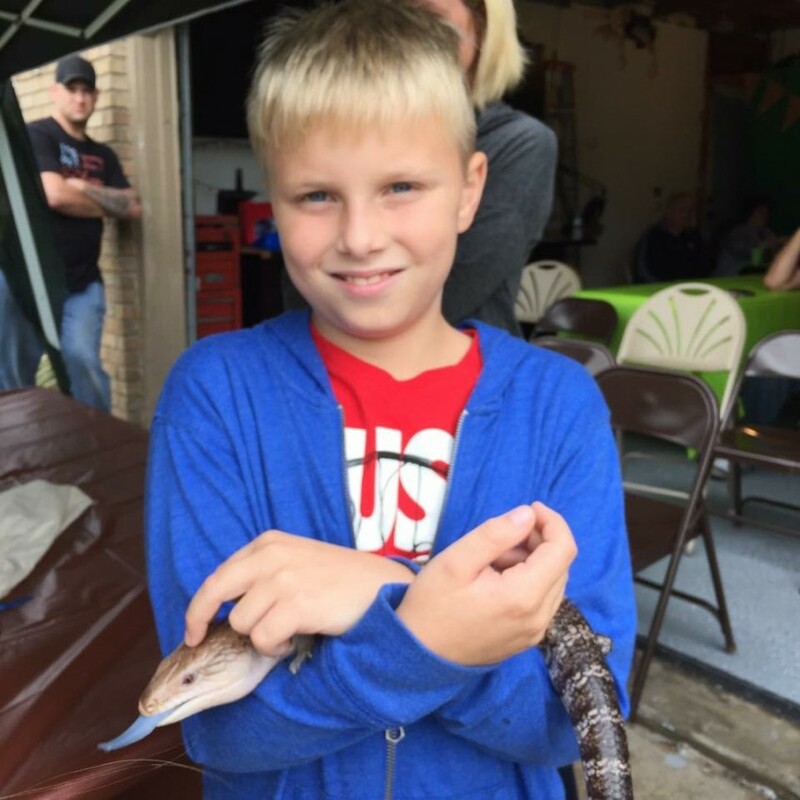 Crosstown Exotics prides themselves on providing memorable experiences with their extensive collection of cold blooded creatures. They transform your event into an hour long excursion through the wilderness with hands on, educational, entertainment utilizing our scaly ambassadors from around the globe. Don't just settle for any animal show, take an adventure. Hire Crosstown Exotics for your next event! The guys came out and put on a great show for my Cub Scouts. Very funny, informative, and cool. Heard great reviews from the parents that were there also. Our shows are a solid 60 minutes of hands-on education entertainment. Our lineup of prehistoric creatures consists of a mixture of 10-12 reptiles, amphibians, and bugs. 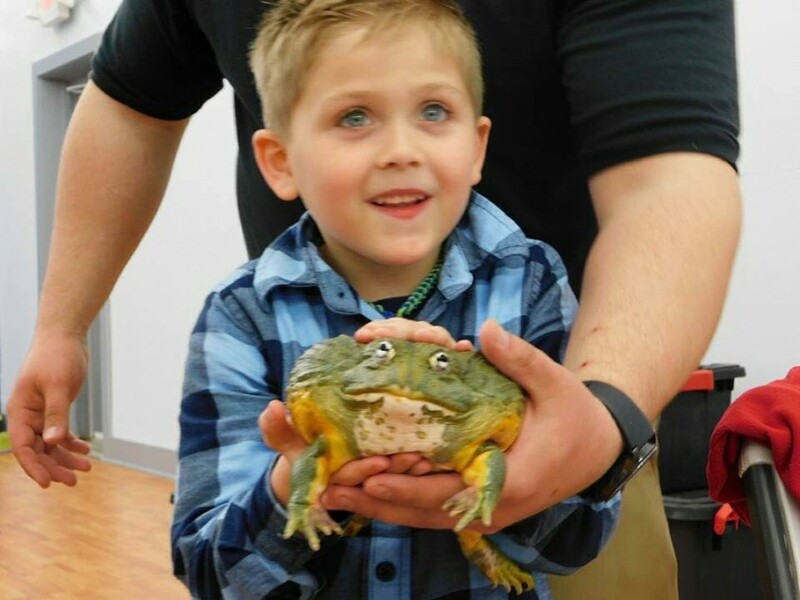 From African giant bullfrogs and hissing cockroaches to a 16ft Burmese python and giant tortoises. Everyone gets to interact with the animals for an experience unlike anything you'd receive at your local zoo. We take pride in providing memorable encounters with our extensive collection cold blooded ambassadors. Our shows are $250 for 60 minutes of educational, hands-on, entertainment. We present each species with a brief introduction and then allow the audience to photograph, touch, and handle the animals. 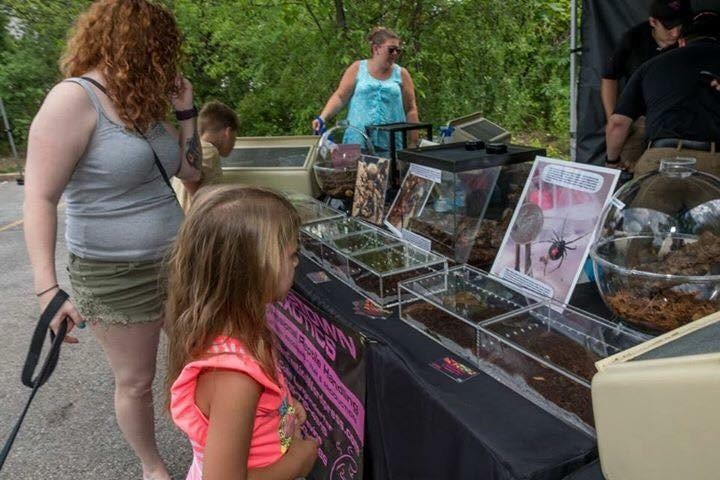 Our line up starts with 2-3 species of bugs, 1-2 species of amphibians, a turtle, a tortoise, 3 lizard species, an american alligator and 2-3 snakes.